This week was a little bit of a challenge for me. Not really miles wise, but food wise. We visited our families this weekend, which of course, included eating. Duh, we're southern. I had a work lunch on Monday, and Kris had a work dinner on Monday. It was tough to always make healthy choices. The eternal dilemma is wanting to eat the bad, but knowing I should eat the good. I'm hoping to be in a place where I no longer want to eat the bad. We'll see how that goes! I do feel, however, I'm back on track. Fingers crossed to staying that way. How did you do? What struggles have you run across this week in your quest for health and well-being? 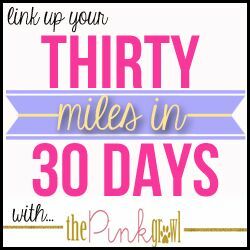 Check out Nikki's blog to learn more about the 30 Miles in 30 Days challenge and consider linking up for June! You are doing great with your mileage! Keep it up lady, and best of luck navigating those work dinners and making healthy choices. I know how hard it can be!!! You are an inspiration. Great job on your milage!! !